The construction of this press is fairly obvious. It was built in a hurry with materials on hand and has a few design flaws. The press was designed with one goal, to punch 2-1/2 and 3" diameter blanks out of 16ga mild steel plate. 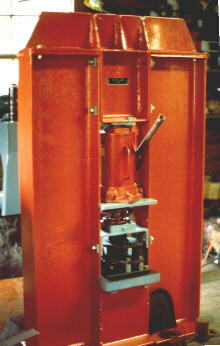 The press AND dieset were built with a torch, grinder, arc welder and a hand crank drill press. Both the dieset and the press originally had babbitt guide bushings. While using the press to straighten a part the guide support was crushed so this is a new one with a bronze bushing. The table support is made of two pieces of the 8" beam and the table is cut from a 1-1/4" plate and has a 3--1/2" center hole to let the blanks fall through. Putting the return spring between the jack and the guide bushing was a mistake. The spring rapidly becomes "solid" or reaches "shut height". The full stroke of the jack was not taken advantage of either. At the time all I was thinking about was blanking thin stock and 3" of travel was more than enough. When I find a couple springs to install externally, I'll also shorten the head block and raise the guide plate assembly. The only piece of the press purchased new was the 20 ton Blackhawk jack. It cost $100 US in 1977. I also purchased standard punches and dies from Roper-Whitney. 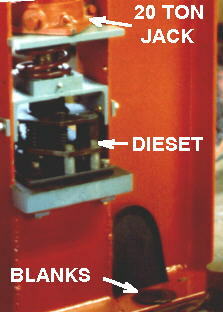 The dieset does not use a pressure pad being designed with only 1/8" clearance. It does have a "stripper" plate. The stripper springs are from an old auto clutch. The parts of the dieset were cut with a cutting torch or forged. The plates were stacked up and match drilled and taped on a small hand crank blacksmiths drill. The guide pins are 1" dowel pins welded into torched holes! Guide bushings are babbitt in welded pipe housings. On completion this press was used only four hours for its intended purpose. In that four hours I punched out hundreds of steel and bronze blanks for candle drip pans. I never had to run another batch! Previously I was hand cutting, torching chiseling, grinding and filing 16ga blanks. I could spent all day making 8 or 10. It took a week to build the press which in turn replaced months of man hours in a half days use! At a later time we will look at the details of punching and blanking and the use of diesets. NOTE: It is far more efficient to use new OR used commercial diesets!